It was many moons ago when I saw this at a City Wide Garage Sale. It instantly took me down memory lane to the good ol' days. We used to have one of these when I was growing up and I just had to have it. "No matter the cost!" I shouted to my cohorts. That day my pockets were lightened by twenty cents! 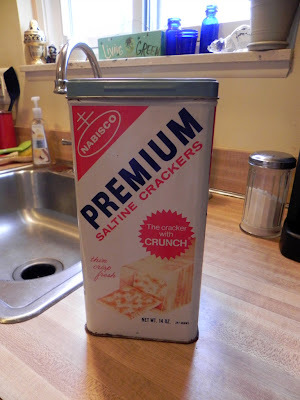 But, we don't have Saltine's. I can afford them because I paid so little for the cracker box. As a side note and the reason I remembered I had this picture - Yesterday, I am not quite sure how I managed to meander over to a section of Etsy where people were selling these. They were selling them for between $10-12.00! My memories of the cracker box are certainly not worth that kind of money, are anybody's, really? I mean, I looove my cracker box but c'mon peeps isn't that a bit excessive?